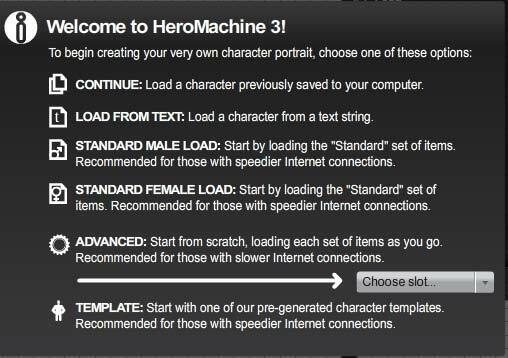 The HeroMachine 3 Alpha has had a major upgrade, and now allows you to load or save characters as text strings to make emailing them back and forth easier. Hopefully that all makes sense ... I'm sure I'll be tweaking it as we go, but it's a good starting point for now. Let me know in comments if you have any issues with it, or suggestions on how to make it better, or a good recipe for bread pudding. Mix all ingredients together and place in sprayed dish. Cover with foil. Bake one hour and 350 degrees. To brown, remove foil during last ten minutes. 1/3 cup raisins optional. I’m not getting the load screen. Do I need to clear cookies or something? Yeah Whit, you probably need to clear your cache. Or just give it time, eventually things will synch up. Well, this one went over without exciting much commentary, which I will take as a Good Thing. Looking over the bug/feature list, it doesn’t seem like there’s anything super urgent. Yes, there are some “Nice to Have” types of things (like the long-awaited Zoom feature) but nothing Earth-shattering. Which means I’m going to let this marinate for a few days while I move on to doing artwork again. I’ll begin with outstanding contest prizes, doing them all in a bunch hopefully, then finishing the conversion of male-only items to female, then … well. Then we’ll have to see. Nice. I think the option to load the Standard templates will be helpful to people new to the program. And the text load is awesome. Sometimes I create a little something at work and it will be nice to send it home for finishing. Is there a way for a user to create and save their own template? I know for me, it would be nice to have a template for my tarot cards, with the text bar the same size and position every time. I know in theory I could just save that as a regular file and open it each time, but the way it’s set up now, I get the impression I can create my own template. And being able to load every single set would be nice, I’m sure there are enough people with internet as fast as mine that would like it. You can make your own templates, yes. Whit, load up all the stuff that’s the same in every one (or in the same position, colors, whatever). Save it as “Tarot Template” or whatever and it’ll show up in the “Your Saves” tab. Load that sucker up when you’re ready to start a new one. Or, if you’ve made a character and think “This would be a good Tarot card”, just load your “Tarot Template” with the “Keep current items” box checked, and all the Tarot stuff gets plunked on top of what you’ve already got. Captain Kicktar, the way to do that is to make a character by loading every set and adding the first item from it to the stage. It’ll look like an unholy mess, but save it as “All sets” or whatever. From them on, just load that up, then hit “Clear All” when it’s done adding all the sets, and Bob’s your uncle — a clean canvas with every set pre-loaded, all in one or two clicks.